Green D.C.: Republicans to Salazar: Drill Baby Drill! Congressman Steve Scalice of Louisiana, left, speaks with Interior Secretary Ken Salazar after his testimony in front of the House Energy & Commerce Committee at the Rayburn Building in Washington, D.C.
A visit to Capitol Hill on Tuesday revealed how badly some Republicans want to start offshore oil drilling again immediately. 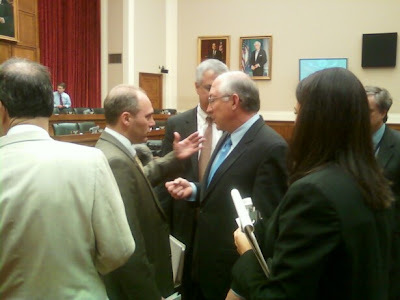 I witnessed the last twenty minutes of Interior Secretary Ken Salazar's testimony to the House Energy and Commerce Committee and saw a barrage of Republican attacks on the moratorium on offshore oil drilling after the Gulf Coast Oil Disaster. Salazar admirably defended the Obama administration's response to the catastrophe and the decision to ban drilling until the safety issues are worked out in order to prevent another disaster. In response to a question from Rep. John Sullivan of Oklahoma about why we are shutting down drilling for six months when we don't stop flying when there is a commercial airline tragedy, Salazar said that "in this kind of dynamic circumstance it seems prudent to have the pause button in place until we can get answers to some very fundamental, important questions relating to safety and relating to protection of the environment." When grilled about the federal response to the disaster by Rep. Mary Bono Mack of California, who said she was a "warm and fuzzy Republican," Salazar stated that our national energy policy has not worked since the 1970s and "that's why we need to have a comprehensive energy program moving forward and that's why the president has been spending so much time on it." When pressed further about the government's response to the disaster, Salazar stood up for their efforts. "We do believe the Gulf Coast will be restored to a better place than it was before April 20th," said Salazar. "This is the most herculean response effort to an unprecedented disaster that the United States has ever seen and I'm on the front lines of it. When you look at the resources that have been amassed to respond to this ongoing problem that is now in its 90th day, it is something that when you realize what the numbers are and the efforts are it makes me proud that the U.S. government is acting in the way that it is."